Electric bike company Stark, which says it has developed “the most affordable electric bike in the world, bar none” has raised $489,619 in a Kickstarter crowd-funding project to finance the launch of its range, exceeding its original target by almost 10 times. 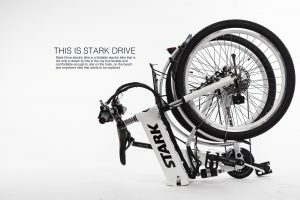 Its Stark Drive City will have a limited launch price of $399 ($999 retail price); the + version of the same bike is $599 (instead of $1,599); and the Advance model is $799 ($2,199). I wrote this on March 7th, 2017. Swedish manufacturer Stark Drive about to launch $399 electric bike. For rarity value, they’ve been superseded by the electric bike (e-bike), even though these machines cost far less, and, with such considerations as embedded carbon – the environmental cost of building them in the first place – are far more eco-friendly. E-bikes are still hard to spot. And, in one sense, literally so, because the battery and motor are quite small, and you might think you’re looking at a conventional bike. Apart from their very low energy use – the removable lithium ion battery has a range of about 30 miles, and is recharged in about 4.5 hours – they could be a tempting option for people reluctant to take up conventional cycling. Different levels of electric support are available, with a top speed of around 25 mph. A display on a control hub between the handlebars gives the essential data: distance, speed and battery life. Electric bikes have a potential appeal to a range of different people, from the downright unfit, and older people who don’t think they’re up to a pedal bike any more, up to people who want a boost for a commute of quite a few miles. And now the argument that e-bikes don’t provide exercise in any meaningful sense has been weakened. Some interesting research from Colorado University in 2016 showed that electric bikes have a fitness benefit even when you use the auxiliary motor. As with electric cars, the price will have to come down considerably before there is a significant public interest. At the moment a good electric bike will cost anything up to several thousand pounds, and there’s not much for choice in the sub- £1000 sector, although there are some very good bikes available. One Swedish manufacturer, Stark Drive, is said to be about to launch a range of electric bikes, of varying specifications, for around $399. The Stark bike comes with a horn and light as standard, as well as a USB port to charge a phone. Close to it in this price bracket is the Sondors bike, on sale for $598. Meanwhile, the city of Oslo has started an incentive scheme to encourage citizens to chose electric bikes. In 2016 it offered residents up to $600 to buy standard e-bikes. The successful take up of that offer inspired Oslo to extend the programme, with grants of up to $1,2000 to local people who want to buy electric cargo bikes — sturdier machines which carry things in trailers or baskets. All residents are eligible to apply for the funds. My earlier piece on electric bikes here.